Sales of Ford F-150 with EcoBoost - launched less than three years ago - have already topped 400,000 units in the United States. Scott, Ford Truck Group Marketing Manager. "Fuel economy is the No. 1 unmet need for truck customers, which is why the F-150 EcoBoost's leading combination of fuel economy and capability is resonating so well." F-150 EcoBoost helped F-series surpass 60,000 sales in October, the sixth-straight month it achieved this milestone - and the first time since the period of April through September 2006. This includes outselling the nearest competitor in the western United States by 67 per cent, where the housing and technology industries are driving truck sales and where EcoBoost technology is proving particularly popular. In the US northwest, F-150 customers choose EcoBoost 45 per cent of the time compared to the national average of 38 per cent. 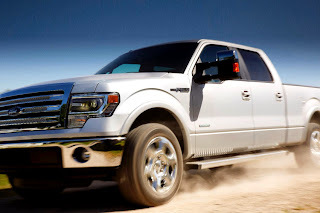 Oregon and Washington - the second- and third-fastest growing states, respectively, according to a June CNN Money report – are key markets for F-150 EcoBoost sales.